The Alabama Capitol with marchers foot prints leading to it's staircase. Montgomery Alabama is a great capitol city. We were only there for a day found and it to be friendly and walkable. Parking was easy and we found a variety of things to see and do. Fred and I drove into the city on a workday Monday and expected to find a lot of traffic. We must have timed it right because we were able to get right in to the Capitol building and found metered parking not far away. Alabama's capitol building is beautiful. White Alabama marble, a grand staircase and a stately rotunda make an impressive structure that is fitting for a Government building. The building (circa 1851) is designated a National Historic Landmark as the first Capitol of the Confederacy. Statues of Jefferson Davis and a Confederate monument grace the landscaped lawns which were originally designed by Frederick Law Olmsted, author of New York's Central Park and North Carolina's Biltmore Estate. Those steps were the end point for Dr. Martin Luther King's 50 mile march from Selma to Montgomery to petition then Governor George Wallace to end racial discrimination in the state of Alabama. 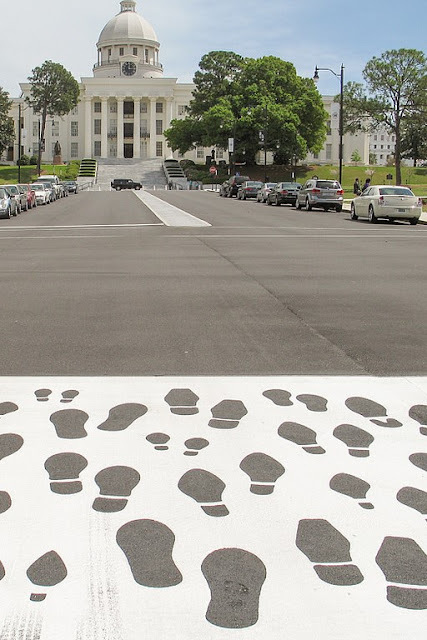 The crosswalks in Dexter Avenue leading up to the capitol are painted like the soles of the many shoes that marched with him. We took a walk down Dexter Avenue and passed the Dexter Avenue Baptist Church where Dr. King led the congregation in the late 1950's. We walked down toward the river and found the site of Rosa Parks bus stop and the Hank Williams Museum before ducking into Alley Station an entertainment district that groups together bars, restaurants, and live music in an environment that provides indoor and outdoor seating away from street noise and busy sidewalks. it was like a little oasis from the downtown heat. The Alley is near Riverwalk Stadium the city's minor league ball field and that's where we found Railyard Brewing Company where Alabama brewer Jamie Ray produces craft ales in a great environment. Railyard offers a pub style menu and a variety of brews from a Pale Ale to a Double Black IPA. The bar is in an interesting old building that was once part of the warehouse system for the railroad. The atmosphere is dark and cozy with exposed brick, old wood beams and railroad memorabilia that included a reception desk shaped like and engine. Fred sampled and enjoyed some of their offerings. We had wandered a long way and made our way back up to the Capitol giving our Fitbit's a workout. No trouble recording those 10,000 steps this day! Our last stop was the First White House of the Confederacy. The building is Italianate Style and is furnished in period pieces from the 1850's to 1860's. It was built in 1832 by a relative of Zelda Fitzgerald and leased by the Confederate Government to serve as the first home of it's President. The house features many artifacts of the Confederacy and Jefferson Davis's presidency as well as a research library. It was an interesting walk back in time to see the house fully furnished as it would have been in 1861. We enjoyed our day in Montgomery and headed back to base. Along the way we stopped at a red light on Maxwell Blvd.and spotted an airplane mounted on poles in a small pocket park. It was a replica of the Wright Flyer. We discovered that the Wright Brothers first flight school was located in Montgomery at the area that is now Maxwell Air Force Base. While the flight school was only in Montgomery for a year it is considered an important reason for the development of interest in aviation in Alabama. I love learning this kind of history. It made our day and we were happy to discover another facet in the history of American Aviation. You've discovered quite a bit of history there, Bonnie. Love it! I never knew that about Maxwell and the Wrights. Very interesting. It was an educational few days Jim. We really enjoyed it.